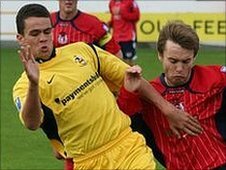 Morecambe have signed 19-year-old Blackburn winger Zac Aley on loan for the rest of the season. Aley joined Rovers from Southport in March last year after coming through the Sandgrounders youth system. The midfielder has made 12 appearances for the reserves this season but has yet to make a first-team appearance for the Premier League side. He has been added to the Shrimps squad in time for the trip to Barnet in League Two on Saturday.